Melbern Liford was born on August 3, 1925. Before he enlisted he was a farmer for his family. His family members are Monroe, Rachel, Leslie, and Doyle LIford. He enlisted in the U.S. Army in Louisville Kentucky in 1943. He died on December 21,1944 in a famous battle called the Battle of the Bulge. In December 1944, Adolf Hitler attempted to split the Allied armies in northwest Europe by means of a surprise blitzkrieg, a swift and intense military attack, through the rugged forests to Antwerp. 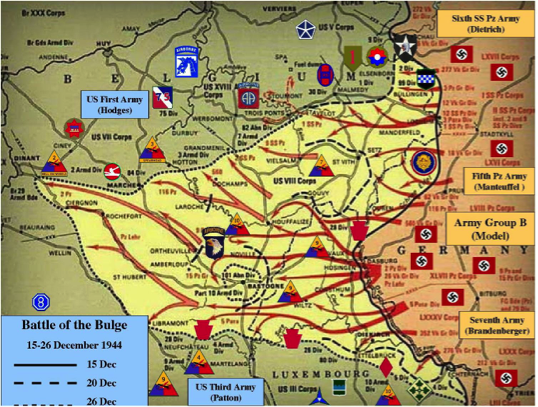 Caught off-guard, American units fought desperate battles to slow down the German advance at St.-Vith, Elsenborn Ridge, Houffalize, and Bastogne; all located in Belgium, Germany. As the Germans drove deeper into the rugged forests in an attempt to secure vital bridgeheads, the Allied troops took on the appearance of a large bulge, giving rise to the battle’s name. Lieutenant General George S. Patton’s successful maneuvering of the Third Army to Bastogne proved vital to the Allied defense, leading to the neutralization of the German counteroffensive despite heavy casualties.